The Rahlves' Banzai Tour (RBT) will return this winter with the same four stops as last year; Kirkwood, Alpine, Squaw, and Sugar Bowl. RBT is a mix of big mountain freeski /boarder cross with 4 racers on a single course at one time. The prize purse for the tour is $80,000. 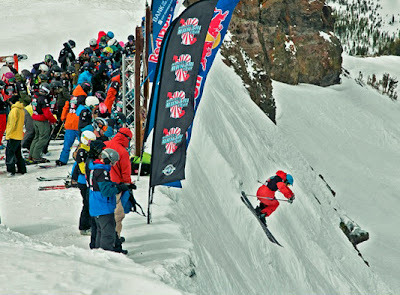 The Rahlves' Banzai Tour was re-born in 2009 from the Silver Belt Races that began in the 1940's at Sugar Bowl. Daron Rahlves, USA Olympic ski racer, and Winter X-Games racer is the host for the 4 stop tour. Rahlves will compete head to head in the Super Final at his home resort, Sugar Bowl. Spectating is fun and free (with your ski pass or ticket). They have a race announcer, music, sponsor booths, beer, and food tents at the bottom of the run.